I've lived in Charlotte for a decade. It's pretty hard for me to believe that it's been that long. And that means this website and blog are now a decade old too. I made this site when I moved to Charlotte as a hobby, and as a way to record my time in Charlotte. Here is the first version of this site that I made. There have been a few revisions. I really didn't know much about web design back then, but I loved the challenge of trying new things. Here is my first ever blog post. It truly is hard to believe that I've lived here for 10 years! It seems like just yesterday I was packing up a Uhaul with everything I owned and my Dad and I made the trip here. In the ten years I've lived here I've met a lot of great friends, had some great adventures, and seen a lot of change in the city. Charlotte really is a great city, and it's grown a lot since I've lived here. The skyline of uptown has changed tremendously. There have been ups and downs … the recession in 2008 was a huge surprise and a setback; the banks did some restructuring but are still a big part of the economy; the opening of the Whitewater Center; the construction of several large skyscrapers down town as well as the BB&T Ballpark; Interstate 485 was finally completed; the first line on the light rail was completed (I've ridden on it, it's nice); The Democratic National convention 4 years ago; just to name a few. 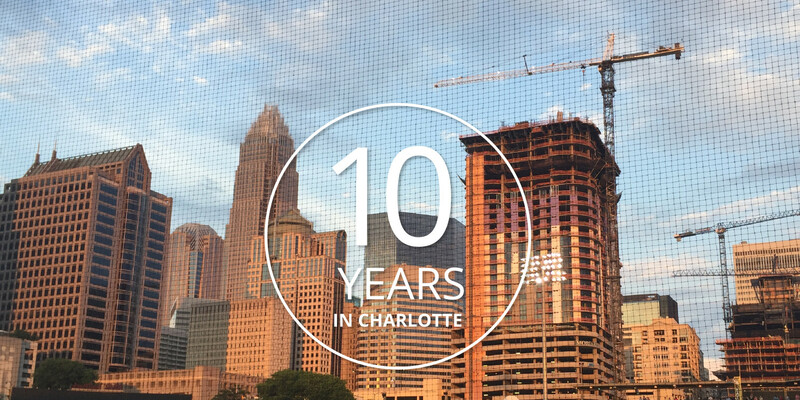 For eight of the ten years I've lived here I worked for Habitat for Humanity Charlotte. The first couple years it was through the AmeriCorps program (a national service program similar to the Peace Corps; in fact, both were the idea of Sargent Shriver). I stayed with Habitat Charlotte working in a lot of different ways: as a Construction Crew leader on New Construction homes, and foreclosed homes after the recession hit, and doing some more unusual things such as selling Christmas Trees as a fundraiser, or driving the largest commercial truck you can drive without a CDL across the state to pick up a load of water heaters from Camp LeJune, or disassembling used cabinets from housing in Fort Bragg, all of which became a source of revenue for Habitat. Ultimately my hobby of website making opening a door to do that work professionally for Habitat. Several years ago I redesigned Habitat's main website and many of their supporting websites. You can see some examples on my portfolio site. It was Habitat that enabled me to explore web design as a career. I'll always be grateful for the experience I gained from Habitat, all of it, even the more unusual stuff. These ten years have come and gone so quickly. It reminds me once again that life is a precious gift. You really have to make time to appreciate it, and appreciate the people in your life who make it precious.